Who gets the starting nod in Smart's absence? First, let me just start by saying that on this iteration of the Boston Celtics, Marcus Smart is irreplaceable. But, "replace" him we must, at least in terms of the starting lineup for the first and likely part of the second round of the 2019 NBA Playoffs, the latter of which may be an insurmountable obstacle without his gritty defense and newfound shooting consistency. The only way forward against Boston's likely opponent in that round, the league-best Milwaukee Bucks, would be to have one of his two most likely replacements take a big step forward in terms of production, those two being mostly-recuperated Gordon Hayward and burgeoning wing Jaylen Brown. You might have been able to make an argument for Terry Rozier, but his struggles this season warrant the Missouri approach ("show me") when the stakes are as high as they are. We may see a little such experimentation against the Indiana Pacers if the Cs can jump out to a 1-0 or 2-0 series lead, but I don't think there will be enough ball movement for Kyrie Irving and Terry to share the court for that much of a game. I think the approach is going to be to continue having Hayward serving as a super-sixth man, using his ball handling skills to run the second unit, and to be on the closing crew on nights when his assertiveness is present. Neither an inconsistent regular season nor the injury to Marcus Smart are giving oddsmakers much pause when it comes to the Celtics' chances against the Pacers. Boston is a -500 favorite to win the best-of-seven. They are also 7.5-point favorites in Game 1 (here are the odds for Game 1 in each first-round series), which gives them about a 75-77% chance of taking a 1-0 lead. The Pacers did a great job of adjusting after Victor Oladipo went down, but just don't have the top-end talent to hang with the best teams in the East in the postseason. 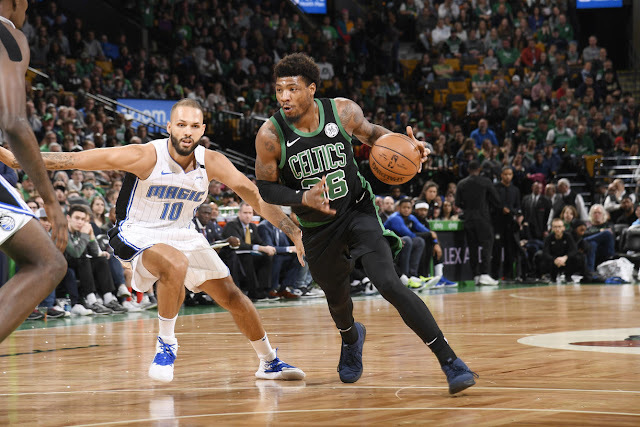 Jaylen, particularly in the absence of Smart, will be needed as one of the team's next-most capable defenders able to cover Indiana's Bojan Bogdanovic, or provide help to Al Horford and Semi Ojeleye against Giannis Antetokounmpo in the next round while being quick enough to get back to perimeter coverage in the event of a kick-out. What do you think? How should Boston adapt in the postseason in this post Smart-torn-oblique-world? Are they doomed yet another season? Does one of the three of Terry, Gordon, and Jaylen sound like the right move? Would Semi Ojeleye be out of the question? Let us know your thoughts in the comments below.